What is Neuroendocrine Tumors ? doctorsandhospitals.in > Medical News > Disease > Neuroendocrine Tumor, What are the Symptoms? 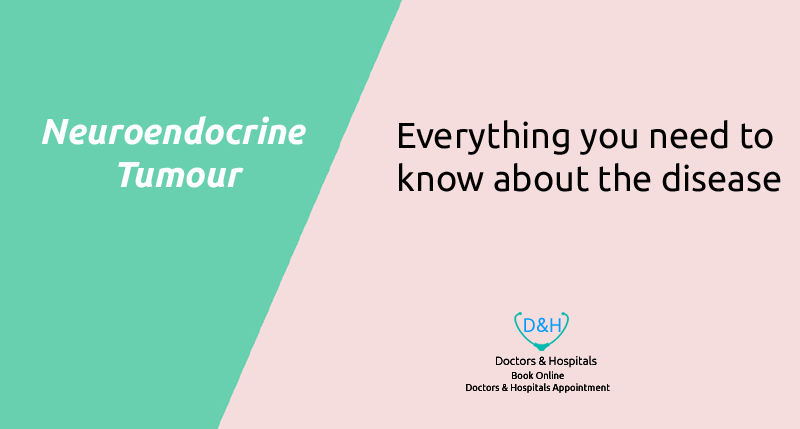 ‘Neuroendocrine Tumor’ is a rare type of tumor that can develop in many organs in the body. However, the number of patients indicates that these tumors are most common in the intestines. The earliest effect is on those blood cells that release hormones in the blood. This disease increases with a very slow pace. But in every case, this is not necessary. – In the body of the patient, in which part of the tumor is done, its symptoms are fixed. For example, if it is in the stomach, the patient will continue to complain about constipation. If this happens in the lungs, then the patient will remain steadfastly. After this illness the patient’s blood pressure and sugar levels increase-decrease. There can be many types of NET depending on the affected organ. These include the Pheochromocytoma, Merkel cell cancer, Neuroendocrine carcinoma and Paraganglioma. – Pheochromocytoma is to do with the chromaffin cells that produce adrenaline and is related to the times of stress. – Merkel cell cancer is a rare and fast-growing cancer that starts in cells just under the skin and in the hair follicles. This condition is also called neuroendocrine carcinoma of the skin. It usually affects the neck and head. – Neuroendocrine carcinoma can also develop in other areas such as the gastrointestinal tract lungs and brain. The doctor has not yet reached any conclusions about the causes of the disease. There may be a variety of reasons for having neuroendocrine tumors. But they are also genetically engineered. It is believed that in whose family such cases have already lived, they are more in its risk. Only after having several blood tests, scans and biopsies, this disease is in the grip. What stage is the tumor, in which part of the body it is and what is the patient’s health. Based on all these, it is decided how to treat the patient.It can be removed through surgery. But in most cases, surgery is used to control disease. In addition to this, such medicines are given to the patient so that the body leaves the hormones in small quantities.